10th April 2009, Obertshausen - Karl Mayer and its subsidiary Karl Mayer Malimo Textilmaschinenfabrik GmbH, are among the innovators in the technical textiles sector and are therefore almost compelled to exhibit at Techtextil. This year the company will show its versatility by exhibiting a range of machine developments for a wide range of technical applications. Examples of this are machines for the production of biaxial and multiaxial multi-ply structures. These textiles which have enormous strength are made from high-performance fibres such as carbon, glass or aramid and form the basis for fibre-reinforced composites. The web structures, which are bonded by thermosetting or thermoplastic means, are used mainly in lightweight constructions, such as car body parts and aircraft components, rotor blades for wind power plants, materials for sports equipment, moving parts for machines, and also in the building sector, where they are used as reinforcing components for textile-reinforced concrete, amongst other things. In view of the rapid upward trend in the composites sector, and particularly because of the high growth rates in the wind power industry, Karl Mayer Malimo has intensified development work in the multiaxial machine sector. The result is the highly innovative Maltronic Multiaxial, which was introduced to the market for the first time at the JEC Composites show in March. In addition to the Multiaxial machine, the RS 3 MSUS-V web raschel machine has proved to be a bestseller for Karl Mayer. The magazine-weft insertion raschel machine turns high-performance yarns into grid structures or all-over warp-knitted fabrics or if required, integrates nonwovens into the structure. It does not matter whether basalt, polyester of polypropylene are used, the range of materials employed knows no limits, Karl Mayer says. Even if thick, high-strength materials such as glass fibre rovings are used, reliable machine operation is ensured by the tuned interplay of robust drives and strong knitting elements, the company adds. Karl Mayer also says that in addition the RS 3 MSUS-V also ensures gentle yarn treatment, high production rates and flexibility in configuring the stitch density. Further highlights from Karl Mayer are web forming machines such as the Maliwatt, Malivlies, Kunit and Multiknit. The textile products manufactured by this high-performance technology are particularly well established in the automotive textile sector Karl Mayer says. Examples of their use are in hat racks, roof linings, seat covers and sub-upholstery materials, insulating materials, boot linings, and backings for adhesive tapes, where the company says, they offer a great deal of chic and comfort. Three-dimensional materials produced on Karl Mayer double-bar raschel machines are also increasingly finding technical end-uses. The novel HighDistance machine from Karl Mayer can produce spacer fabrics with a thickness of up to 60 mm. The main features of these high-performance textiles are an end-contour-true shape and a workpiece-like character, which means that they can be used immediately after finishing. 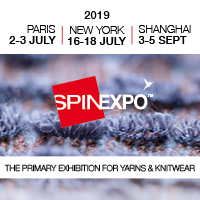 Areas without spacer yarns can be used as well-defined flexing points or textile joints, for marking separating points, and for connecting areas of different thickness within the textile. By using different industrial yarns it is possible to utilize the characteristic features of the HighDistance as required. Another Karl Mayer specialist area is the production of nets and the company’s innovative raschel machines produce agricultural, protective and shading nets, baling and pallet nets, and air-permeable packaging materials of all kinds, and set standards as regards productivity and quality. However, Karl Mayer does not just develop innovative machine technology for direct textile production; it also develops machinery for the processing of technical yarns during warp preparation. For example, the motor-driven Rot-O-Tens combines gentle yarn treatment with maximum quality and efficiency standards when high-performance technical yarns such as glass and aramid are employed. In addition,the Multitens yarn tensioner, a high-tech product from the recently acquired Benninger weaving preparation division, is best suited for use in technical applications, Karl Mayer says. In the warping machine sector Karl Mayer has the Opt-O-Matic for the production of warp beams for technical applications. On the so called OOM, the patented tape application system ensures uniform tape circumferences even in the case of highly-sensitive yarns as a result of high warping rates and has become well established in important sectors such as the automotive industry. Karl Mayer offers the technical textiles sector machines which are the result of decades of experience in machine construction coupled with the company’s drive to continually innovate. Visitors to this year's Techtextil can see the results at exhibition stand B 07 in hall 3.0 at Techtextil.